Asia News Report: For two days, heavy rainfall has been pounding the Papuan highlands. Landslides and floods caused 70 deaths in Sentani and seven in Jayapurah. About 350 houses and three bridges have been damaged. Two earthquakes are the cause of the landslide that killed two Malaysian tourists in the north of Lombok. Jakarta (AsiaNews) - Sudden floods and landslides triggered by torrential rains in two places in the Indonesian province of Papua have killed at least 77 people, causing 74 wounded and 4,150 displaced residents. The National Agency for Disaster Mitigation (Bnpb) also reports that two people lost their lives and more than 30 tourists are believed trapped in the landslide that occurred yesterday on the island of Lombok. In Papua, the easternmost province of the Indonesian archipelago, heavy rains hit the highlands of the Cycloops Mountains the evening of two days ago, continuing up until noon yesterday. The massive deforestation of the area has contributed to the formation of the landslide which, together with enormous amounts of rainwater, has poured downstream onto the town of Sentani, in Jayapura's regency. Sutopo Purwo Nugroho, a BNPB spokesperson, reports that there are 70 victims in the area. In addition to these, there are seven others, who died from the landslides that hit the nearby provincial capital Jayapura. The number of victims "is likely to increase because the evacuation process is still ongoing and not all affected areas have been reached," says Nugroho. Dozens of bodies have not yet been identified. At the moment, about 350 houses, three bridges and a Twin Otter airplane parked at the airport have been damaged by floods (photo). The airport of Sentani, the main transport hub of the province, remained open. Further east in the country, another calamity has affected the island of Lombok. 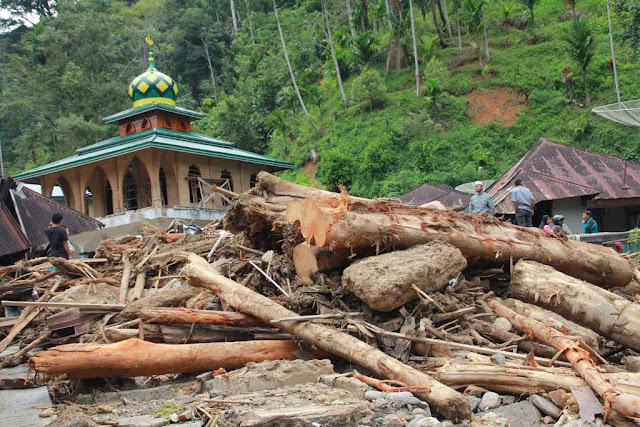 Two moderate intensity earthquakes triggered the landslide that claimed the lives of two Malaysian tourists at the Tiu Kelep waterfall in the north of the island. The authorities report that, at the time of the tragedy, there were about 40 fellow citizens with them. Of these, 22 remained trapped in the landslide, while seven were transported to the hospital. The search and rescue teams have so far managed to rescue only three people.